As outside observers of the NASCAR raci ng scene, we guess a lot. We watch and read and mostly put our own spin on what we have watched and read. But we don't know what's going on for the most part. You can get closer to the truth by talking and listening to others who are nearer to the action but rarely will you get the real, whole truth. Dale Earnhardt Jr. doesn't expect too many big bonding sessions between him and his new Hendrick Motorsports teammates, Jimmie Johnson, Jeff Gordon and Casey Mears. My favorite racing film is the John Frankenheimer directed Grand Prix that came out in 1966. The movie is based upon the Robert Daley book, The Cruel Sport. 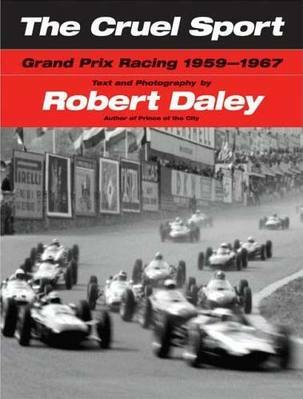 The sub-title of the book is Grand Prix racing 1959-1957 and it is Daley's chronicle in words and pictures of those seasons from a very up close perspective. It is a fascinating read and I don't feel qualified to write a proper review. If you have any interest in auto racing and the people who drive the cars, read it. "How can you be friends with a racing driver? You try to beat them all day on the circuit, and then at night you're supposed to forget all that? I think all racing drivers secretly hate each other anyway." I believe that attitude is probably closer to reality than any notion of real closeness among teammates. People seemed shocked that, during his last seasons with Penske, Rusty Wallace couldn't seem to get along with Ryan Newman. Rusty was a guest ON PIT ROW last week. I wish I had asked him the same question that Daley asked Hill. It looked for much of the night like Kasey Kahne would pull off the double win at Bristol. 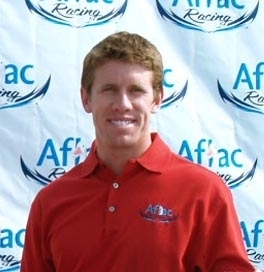 Carl Edwards used a pick from Micheal Waltrip to pass Kahne with 166 laps to go in the race to post his second win of the 2007 season. Edwards picked up 10 more bonus points to begin the Chase for the Championship in three weeks. Dale Earnhardt Jr. was only able to gain five points in his quest to make the Chase. Bristols new concrete coupled with the new banking configuration led to much side by side racing. More so than ever there were three distinct grooves for the cars to utilize. Did the resurfacing of Bristol ruin or enhance the racing? 1) Will a Mark Martin/Aric Almirola tag team effort keep the fans from booing the #8 next year? 2) Jacques Villeneuve will most likely join Juan Pablo as non-US born drivers in Cup cars in 2008. Is this what NASCAR had in mind with its diversity program? 3) Should NASCAR come up with an appeals process during a race to keep from making mistakes like happened to Rowdy in the Busch race? 4) Will there be any changes to the top 12 with 2 races to go or are we set? Let us know how you feel; about these questions, or anything else that happened during the short week at Thunder Valley. 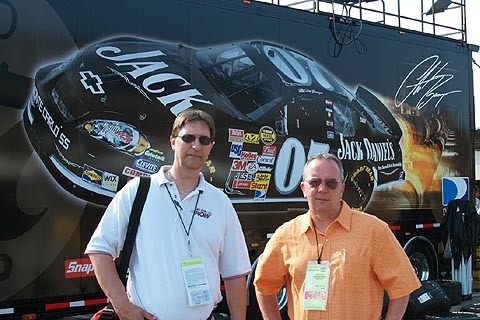 If we like your comments, whether we agree or not, we could use them on the air during Tuesday's ON PIT ROW. Leave us a comment on the blog or call the show--toll free at 1-877-502-8255 between 5-7pm edt on Tuesdays. Juan Pablo Montoya has captured much of the available facination so far in NASCAR 2007. JP is a remarkable driver. Indy 500 champion, multi-time winner in Formula One and already this year a Daytona 24 hour and NASCAR Busch Series winner. The 2007 F1 season kicks off this weekend in Australia. Great drivers compete here. As I watch and scan the driver rosters I don't see the likes of Juan though. His cross platform, cross series, not to mention cross continental , driver for all seasons career path is pretty unique today. Forty years ago I followed two of my heroes as they drove everything, it seems, with four wheels. Jimmy Clark and Dan Gurney are two of the greatest race car drivers to ever live. They too drove, and won in F1, sports cars, USAC Championship (later Champ/Indy Cars) and NASCAR cup cars. Clark won a couple world championships in F1, 25 Championship Grands Prix, The Indianapolis 500 and countless sports car and saloon car events. Dan was my man. Though he didn't win as often as Jimmy (no one did) he did win in F1. 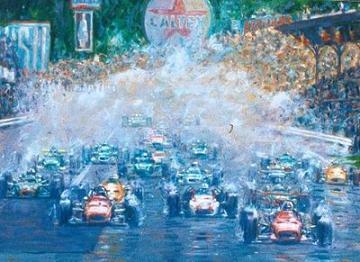 In fact he won in the only American built Formula One car to ever win a modern Grand Prix, at Spa in 1967. The beautiful painting of the start of that race the following year is by Rob Ijbeme from his Car a Day Fast Painting site and it was his painting that inspired this post. That era of auto racing is my favorite. It was difficult to find any timely racing news then. Print media coverage was spotty and TV/Radio nearly non-existent. I do remember be awakened by a radio sports report announcing the death of Jim Clark, in a Formula 2 race at Hockenheim, that 1967 season. I'd never heard of Hockenheim. Formula 2 was probably equivalent to the Busch series. I lay in bed for a long time that morning. It's funny, but I think about that day when I hear Don Mclain's "American Pie". I heard it tonight. Another spark to write this. Dan Gurney designed and built the Gurney All American Eagle/Westlake that won that 1967 F1 race at Spa. It is the most beautiful racer ever built. He teamed with AJ Foyt, in a Ford GT MkIV, to win the 24 Hours of Lemans that same year. Daytona 24 Hours, USAC Champ Car and Can Am Challenge races; been there, won those. Riverside International Raceway belonged to Gurney. The original road course ringer won six NASCAR Cup races at the California track. Jimmy Clark never won a NASCAR race. He did drive a Holman-Moody Ford at Rockingham. Finished 30th with a blown engine. I wish I could have seen it. For real.